Update May 2017: Android Wear 2.0 OTA update zip files for LG G Watch R and LG Watch urbane are now available for download and install. The Android Wear 2.0 was first announced back in February and manufacturers all across the globe have been working on it ever since. The LG Watch Urbane is the first device to receive the Android Wear 2.0 OTA based on Android 7.1.1 Nougat OS. Moreover, the OTA download link has been captured for the LG Urbane first Gen watch with codename lge_bass_bass. This is the sister device of the Urbane 2 receiving the official Android Wear 2.0 Developer Preview. The update is followed by this year’s latest Android Wear technologies from LG like the LG Watch Style and the Watch Sport. With the official 7.1.1 Nougat update, the watches are much more stable and full of new features. All these watches are now running Android Wear 2.0. This can only mean one thing that other Android watches like the LG G Watch R and LG Watch Urbane 2 OTA updates are soon coming up. Not much is known about the stability of the update at the moment. However, it does bring Android 7.1.1 Nougat to all LG watches with Android Wear 2.0. The OTA comes directly from Google’s servers from the AOSP repository. It comes in a package of 229 MB in size and will take the watch from 6.0.1 Marshmallow to Android 7.1.1 Nougat. The OTA zip is only an incremental OTA update. The best way to install it is via ADB sideload method. 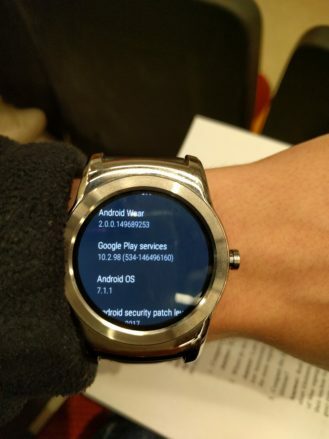 Check out our very popular post about installing OTA updates on Android wear easily. Download the OTA and head over to the tutorial on Asus Zenwatch to know how to update.